During our time in Iguazu, we stayed at the Sheraton Hotel within the National Park. No real choice there for us because to stay in town would mean commuting several kilometres with the transport being erratic very early and late. One annoyance, though, was that the National Park was only open from I think 8am to 5pm so we were not able to be at a dramatic vantage point for sunrise or sunset. The amount of water going over is indeed impressive. There is a narrow-guage train to ferry people to the various walks. 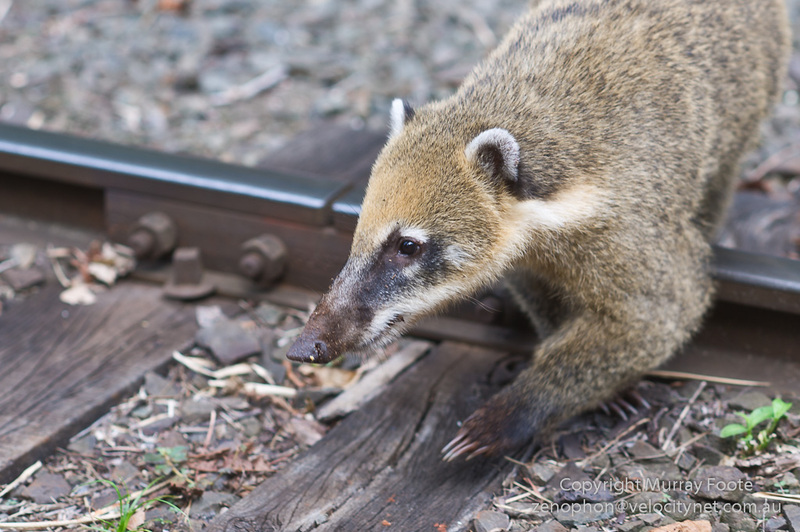 While many people were waiting at one of the stations, several coatis (related to racoons) turned up in search of handouts. Here is one crossing the railway line. With an hour to spare before we needed to catch a plane, I went for a walk with one lens intending to photograph some butterflies. That didn’t happen (too many people) but I hadn’t been to that section of the track and didn’t anticipate how good the view would be. With no time to go back for other alternatives, I shot over 100 images to combine them into the image below (and it’s also the 100th image posted for the trip on this blog). Use the first and second icon or the mouse wheel to zoom in and out – then hold down the left mouse button and move around the image. Inside the image you may find about sixty birds, one in flight, four platforms of people in Brazil (most of the image is in Argentina) and one butterfly. 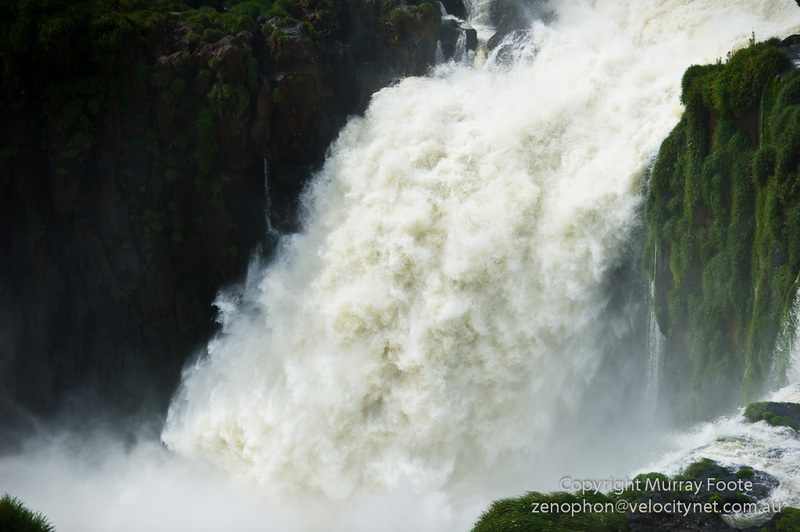 Then time for more plane rides – Uguazu Falls to Buenos Aires and after some hours in the airport, Buenos Aires to Santiago. We arrived very late at night in Santiago to a warm impromptu welcome from some people passing in the street. This entry was posted in Iguazu Falls and tagged Argentina, Coati, Iguazu Falls, Photography, Travel, Waterfall. Hope you got home safely from Tahiti OK. We met you on the wave-lashed shores of Easter Island on a rainy Tuesday. Enjoyed your blog so far, and some fabulous shots. I must say this one of the Iguasu is superb. I think it’s probably a good thing you didn’t have the right lens! But I imagine it was a huge job piecing together the telephoto images to make up the composite. What software did you use? Tuesday 26th. That must have been Vinapu or the South coast. I’d been using Photoshop CS5 for panos but it was failing on quite a few so I looked for alternatives. I checked out Windows Live Photo Gallery (free/ simple), Hugin (free/ complex), PTGui and Kolor Autopano Pro. I went for Autopano Pro. Researching the alternatives by downloading trials and then compiling this composite did take a while. Even with Autopano, I needed to manually include some frames in the bottom right where the joins are only water to water and exposures vary (though some rocks are visible under the water). I discovered this morning that there is some ghosting is a few places (such as the horizon above the left end of the falls). You won’t be able to see that in the web image but I will want to print it. Autopano did warn me about some bad joins so I’ll have to go in and investigate. a beautiful result with the 100 images, looking forward t viewing the print.